Twice cooked pork (also called double cooked pork), along with Mapo Dofu, hot pot and Kung Pao chicken, is probably the best-known Sichuan-style Chinese dish. The process of cooking Twice Cooked Pork involves boiling belly pork steak chunks in hot water with slices of ginger and salt first, then after being cut into thin slices, the pork is returned to a wok and shallow fried in hot oil. 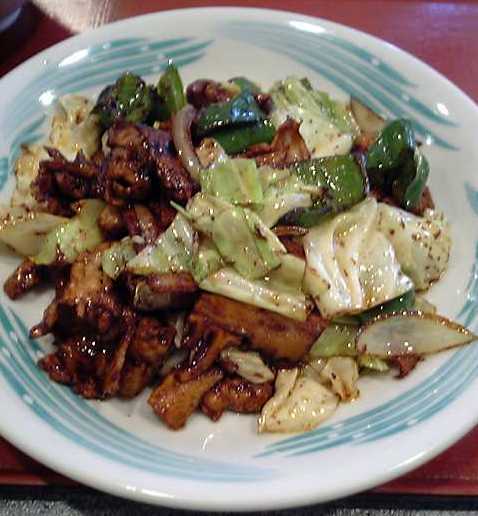 The most common vegetables to accompany the pork in Twice-Cooked Pork are cabbage and peppers. The dish is said to have originated from the Qing Dynasty, while the Qianlong Emperor toured Sichuan. Qianlong demanded a feast in every stop that he made, and, when he approached one particular village, the villagers fretted. The crops had not been harvesting well that year and there may not have been enough to host the emperor. Fearing prosecution, the villagers hastily dumped their leftovers into the pot, cooked them again (thus "twice cooking" them) and served the resulting dish to the emperor. To their surprise, the emperor enjoyed it, and so the "twice cooked pork" became a famous Sichuanese dish.